With AF-P DX NIKKOR 18-55mm f/3.5-5.6G on your DX-format DSLR, you'll be ready for anything. Part of Nikon's new "P" series of lenses, it uses a pulse motor (utilizing stepping motors) for ultra-fast, near silent autofocus and two Aspherical lens elements for outstanding optical performance. Capture wide landscapes and group photos one moment, then tight portraits, family sporting events and smooth HD video the next—all with phenomenal clarity and precision. Compact, lightweight and extremely versatile, this lens will be your gateway to better photography. Unleash the potential of your camera's high-resolution sensor. 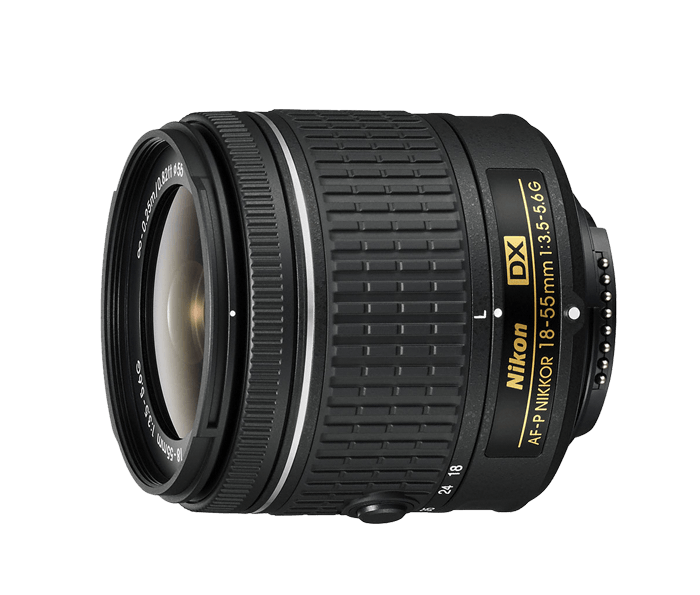 The AF-P DX NIKKOR 18-55mm f/3.5-5.6G features the superb optics and advanced technology used on Nikon's high-end lenses. Two Aspherical lens elements achieve superior optical performance, giving your photos and videos rich, vibrant colors, deep contrast, minimal distortion and beautiful soft backgrounds, even in less than ideal conditions. Nikon's new "P" series of NIKKOR lenses use a pulse motor (utilizing stepping motors) to focus smoother and quieter than previous drive systems. Bring subjects into focus instantly with absolute precision. When recording video, smoothly shift focus from subject to subject with practically no drive noise.